Generally, I can write a blog for most things as long as they are wedding related but when it comes to writing about myself its always a little harder! TeamBride is my baby and its just me and some very very supportive and patient friends and family supporting me behind the scenes! 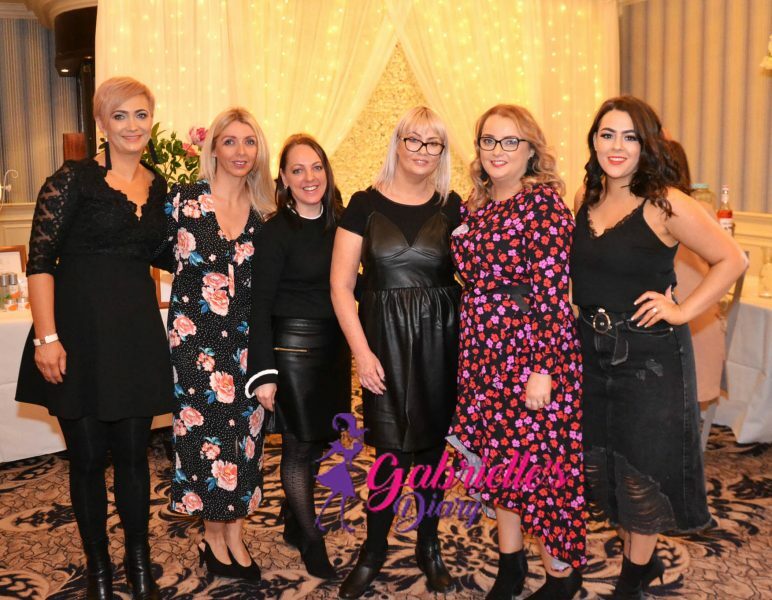 The second Team Bride Wedding Beauty Fashion Workshop took place on February 4th 2018 in the Clanree Hotel Letterkenny. 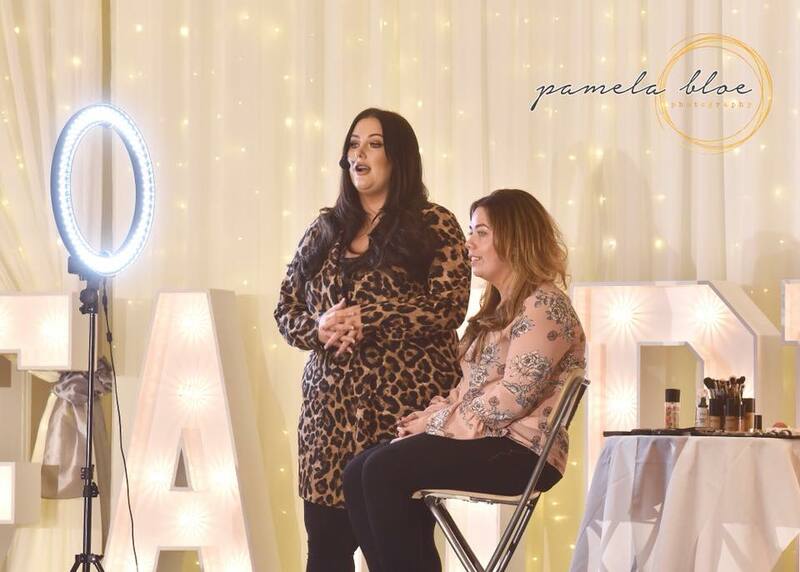 When I decided to go ahead and host a second event I was filled with excitement but also beyond nervous – much more nervous that the first event which is weird! Even on the day itself I was much more nervous than I was last year – 2018’s event was bigger than the last one and the pressure was double! 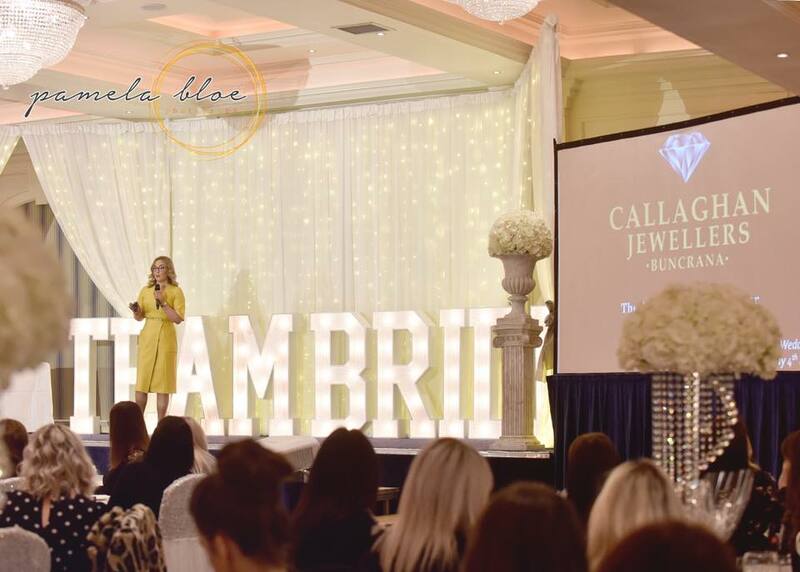 For the event I wanted to give guests a fun day out while also getting valuable tips and advice on all things Wedding Beauty and Fashion related – TeamBride style! 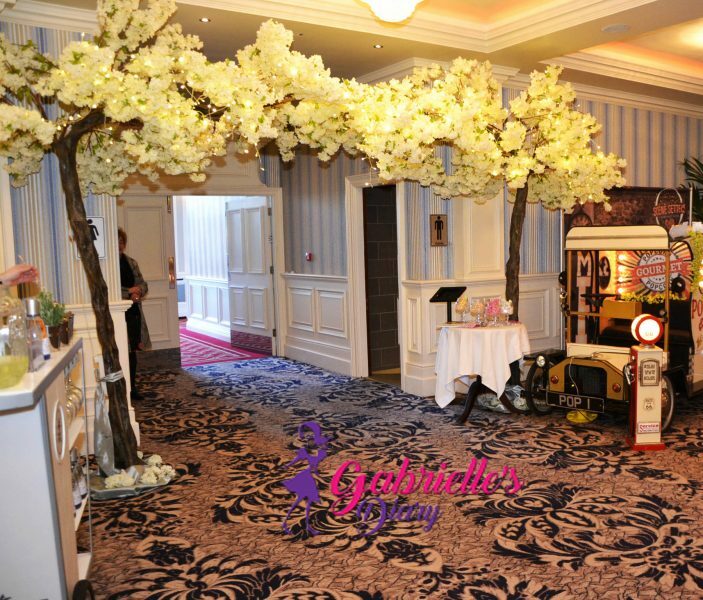 With the creative talents of the amazingly generous Olivia and her team at Ultimate Touches the Shellbridge Suite of the Clanree Hotel was transformed into the most beautifully elegant room I have ever seen. When Olivia asked what I wanted for the room décor I said I wanted it to create impact without being OTT and that I trusted her and her experience to do what she does best. 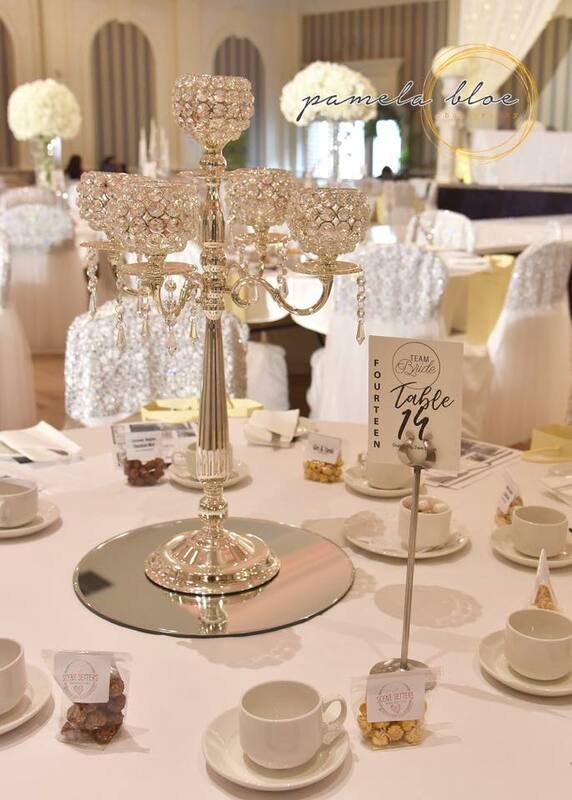 I almost cried with joy when I say the completed room, it was more than I could ever have imagined and was impactful while also being understated with clean white lines, crystal centre pieces and a stage backdrop of my dreams! 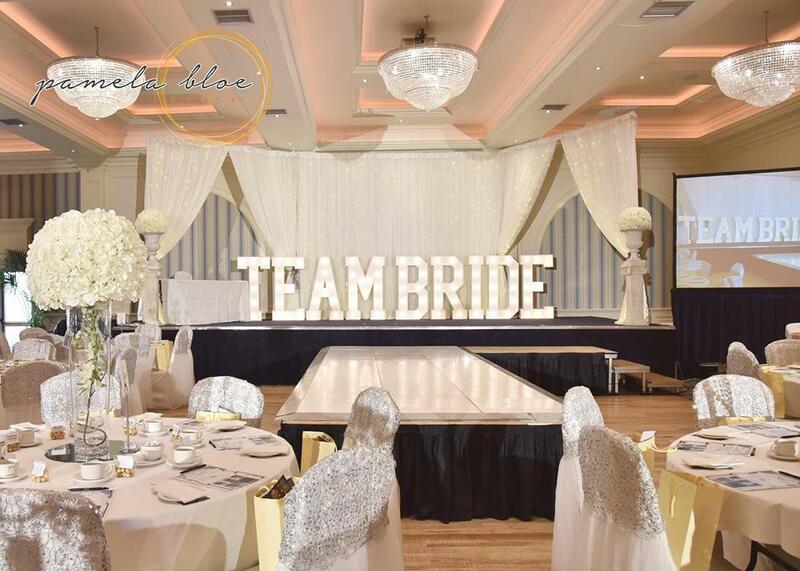 I always had the vision of having TEAMBRIDE in lights and Scene Setters brought this to life for me – it looked AMAZING and worked so well with the other décor. I really really want to have those light up letters at home but according to my husband it would be a little OTT! 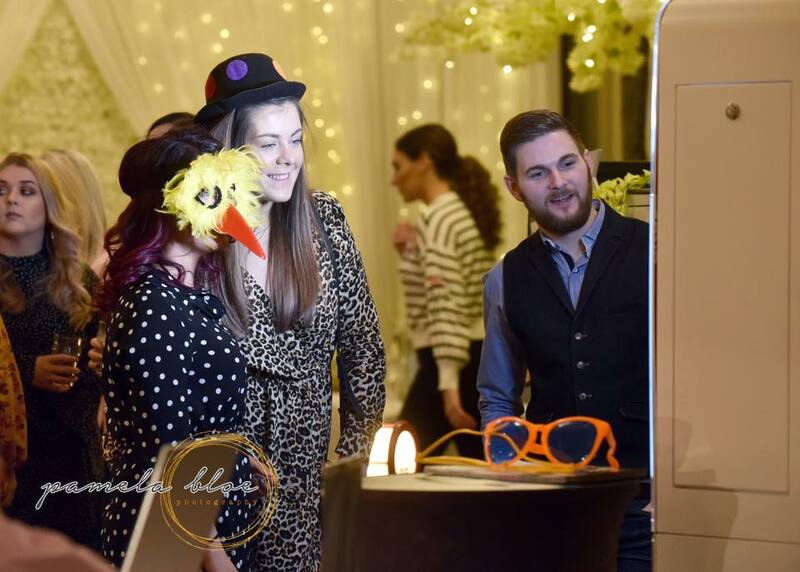 Along with a fab range of light up letters that includes Mr & Mrs NEW NAME, Scene Setters have a quirky vintage inspired Popcorn Van that went down a treat with everyone on the day! They had every flavour you have never imagined from chocolate orange to gin flavoured popcorn. The van was such a talking point on the day and worked perfectly alongside the selfie pod for fun photos. When it comes to events and shows I am super picky and think attention to detail is so important. The Catwalk element of any show is always a highlight and I wanted it to be captivating and professional. 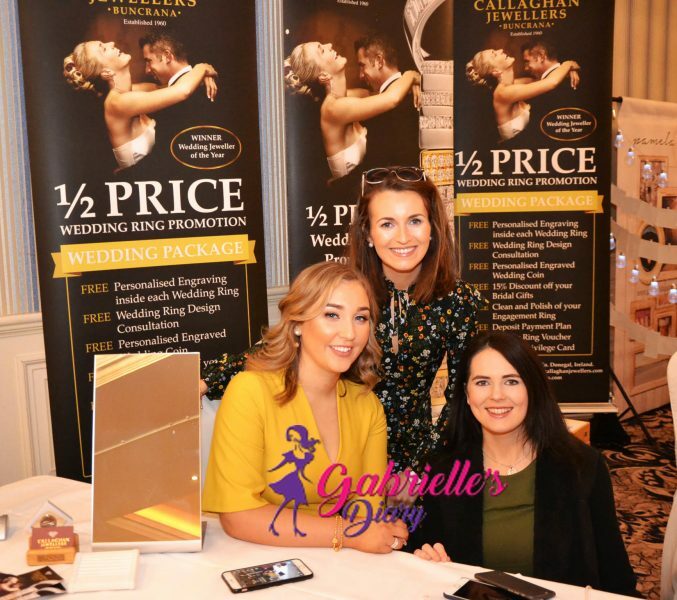 To do this I enlisted the help of the professionals from G&G Hair & Makeup, Pearls & Lace Bridal Boutique and McElhinneys Department Store and of course some fabulous local models who where amazing! 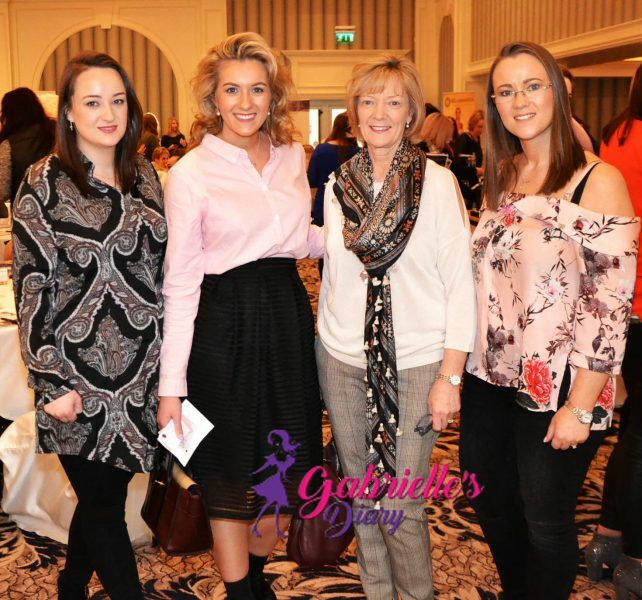 Aoibheann Walsh and her amazingly talented team at G&G created a range of looks on our models to showcase a range of different looks for brides of all styles. Combined with the gorgeous range of dresses from Pearls and Lace, the models looked like they stepped out of a bridal magazine! Pearls and Lace showcased a small selection of their designer wedding dresses and had dresses to suit every style you could imagine. When it comes to Occasion Wear for Mums and guests, nobody has a selection like McElhinneys! The style showcased on the catwalk was fab with a red trouser suit absolutely stealing the show! The afternoon was filled with Gin Cocktails on arrival courtesy of Ginmare and MCM Spirits, onstage talks and demos from our experts (see Part II for more on that), browsing our Pop Up Shops and enjoying a delicious afternoon tea. 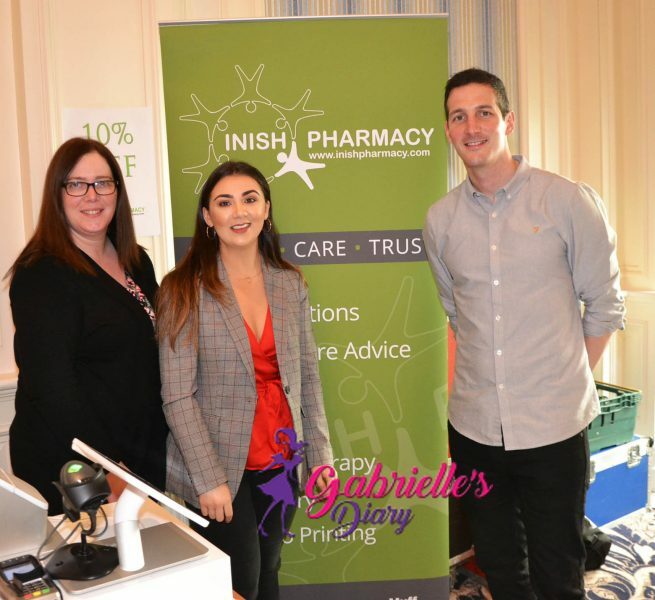 One of the main talking point of the day was the jam packed Goodie Bags which where kindly sponsored by Powder n Pout, Inish Pharmacy, Bellamianta, Note Cosmetics, Sleek, MOXI, KISS Cosmetics, Declare KD Cosmetics, McElhnneys plus a range of vouchers and offers from all our Suppliers. Lots of people went away with lovely spotprizes and the TeamBride Scratch cards went down a treat!! Despite my nerves and many sleepless nights the Workshop turned out better than I could ever have imagined and I am so grateful to everyone who purchased tickets and chose to spend their precious weekend time with teambride. I tried to speak to everyone and truly hope that you all enjoyed the day, it was so nice to chat to everyone and have the craics. A massive thank you has to go to my family and friends who helped me behind the scenes – I honestly could not have pulled it off without the help of some very kind and giving people. 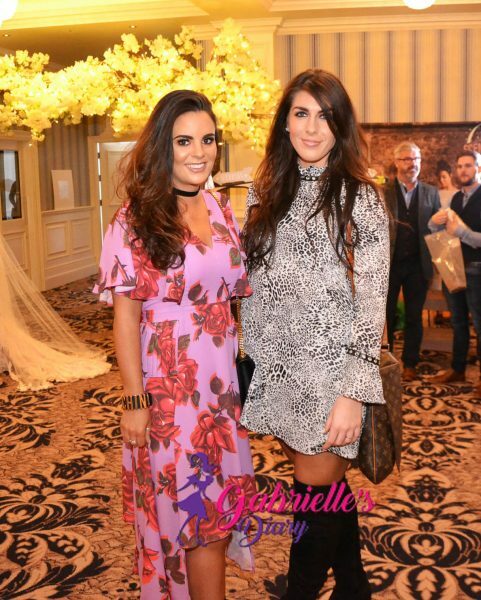 Also a quick mention to those who have helped support and promote TeamBride – Gabrielles Diary, Donegal Woman, Styled by Sisters, Snazzy Yazi Blog, Rebecca Rose Stylist, Sinead De Blogger, The Sequin Cinderella, Girly Inspo Corner, Diet Starts Monday Brenda Doherty Hair and Makeup and Passion by Natasha.